The PANDORA Black Friday is almost here! 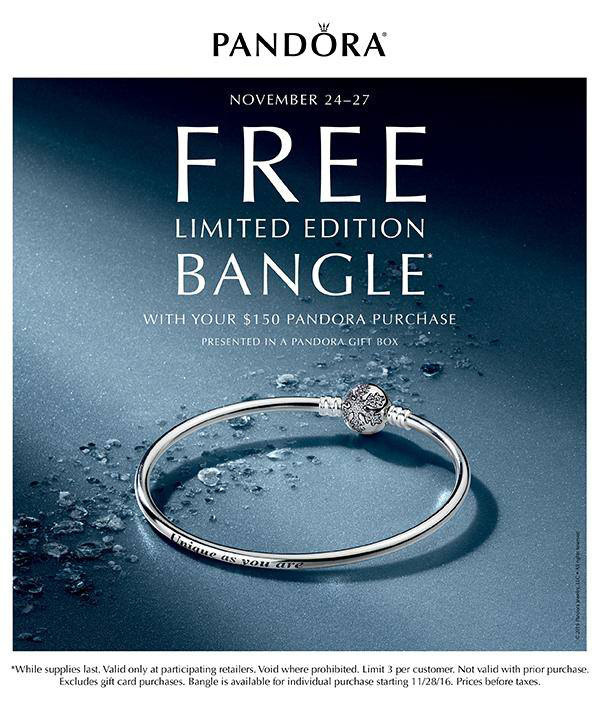 Starting Thursday November 24th spend $125-$150 (depending on the store) or more on any PANDORA and you will receive a FREE Limited Edition Unique Moments Snowflake PANDORA Bangle! The Black Friday promotion runs Thursday November 24th to Monday November 28th 2016. What do you think of the Limited Edition Unique Moments Snowflake PANDORA Bangle? Do you like the Limited Edition Bangle designs? Which is your favourite PANDORA Bangle? Let us know in the comments below. I am excited for this promotion! I can’t wait to get the bangle, it is gorgeous. It’s a very nice bangle, I particularly like the engraved message. Thanks for the comment ? Just saw it yesterday. It is so pretty! Yes, exciting time for Pandora fans! ?